Diverse Specialties takes skid steers and tractor-loaders to a new level with their innovative Boom-Grapple. 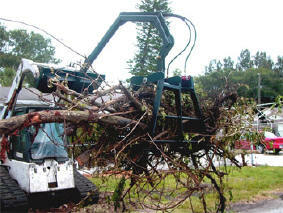 This attachment combines grapple truck capabilities with the versatility of a skid steer and for a fraction of the cost. During the 2004 Florida Hurricane season with its millions of yards of storm debris, the need was evident. Despite the number of skid steers out there collecting debris, many of the trailers and trucks were too tall for standard buckets and grapples to load. The Boom-Grapple now makes it possible to reach easily over the sides of any road legal vehicle. As versatile as skid steers themselves, the Boom-Grapple literally extends operating capabilities beyond their current reach. Suitable for cleaning ditches, lakes and pond banks…placing lintels and trusses…limitations are your vehicles’ operating capacity and your resourcefulness. Utilizing standard hydraulics…NO wiring harness! ...and a 2 pin quick hitch, the Boom-Grapple can be used by most skid steers, rubber-tracked machines and larger tractor loaders. Diverse Specialties, Inc. is the culmination of more than a quarter century of fire-fighting, professional rescue, farming, and construction and demolition experience. Bringing together expertise in the public and private sectors, Diverse Specialties delivers innovative and cost-effective solutions for use in disaster-related situations and everyday contracting. visit our download center to download it to your desktop. The Boom Grapple should only be placed on machines with a longer wheel base or track machines – preferably with enclosed cabs. The Boom Grapple should only be operated by qualified and experienced skid steer or tractor loader operators. Seat belts should be worn, even with the safety bar down. Hard hats and safety glasses should always be worn. When attaching the Boom Grapple to the skid steer, always make sure the attachment pins and dogs are properly secured. 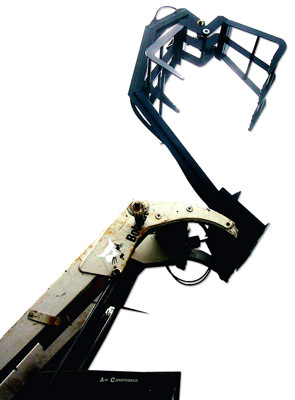 The bottom plate of the Boom Grapple is deliberately designed to ground when the skid steer arms are down. This feature will help to stabilize the machine and slow forward tip motion if the load is too heavy. The Boom Grapple’s capabilities are dependent upon the lift capacities of each machine. If a load cannot be boomed in, you are probably exceeding the capacity of your machine. The operator should carry the load low and ALWAYS BE PREPARED TO DROP THE LOAD IF THE MACHINE BECOMES UNSTABLE. All loads should be boomed in and kept as low as possible when transporting. NEVER GO EITHER BACK OR FORWARD , UP OR DOWN STEEP SLOPES WITH RAISED LOAD. SIDE SLOPES ARE ALSO DANGEROUS. When booming out to dump load in trailer or truck, be close enough to drop load or use the side of the truck or trailer for stabilization should machine feel unstable. When using the Boom Grapple for ditch or pond bank work, avoid areas where your machine can get stuck. The Boom Grapple, unlike a bucket, is not designed to push a stuck machine free. Neither was the Boom Grapple intended for sideways pushing, pulling or lifting. As with any excavator, backhoe, crane or boom machine, EXTREME CAUTION should be exercised when operating in the vicinity of electrical power lines. Under NO CIRCUMSTANCES should anyone get under or allow someone else to get under a load. To use the boom without the grapple, remove the hydraulic hose from quick release rings and main 1” boom bolt. Add a clevis or other means of attachment through this hole. When lowering the Boom Grapple to unhitch, skid steer arms may need to be slightly raised, which still allows the cab door to open. Plate can also be used for leveling ground. Loading and unloading your skid steer with the Boom Grapple attached onto a trailer for transport should be done with boom out and down, slowly and carefully. Diverse Specialties, Inc. shall not be liable for incidental or consequential damages. Upon purchase, the buyer assumes all liability for personal injury and property resulting from the handling, possession and use of the goods by the buyer.